I should be interested to receive photographs taken inside The George Moore Memorial Hall before it was sold by the Trustees around 1982. 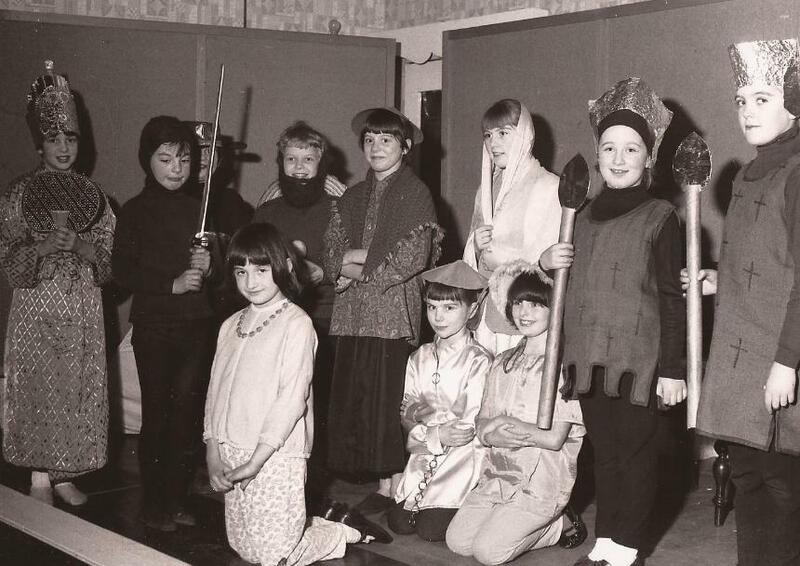 To date the only photographs that I have, taken inside the historic building, shows the Mealsgate Brownies performing a play in 1969, members of Mealsgate Amateur Dramatics group in the Emlyn Williams' play 'Night Must Fall' . The former was brought to my attention by Julie Edgar and is reproduced below by kind permission of 'The Cumberland News' who own the copyright whilst the second picture is provided courtesy of Mr Alex Bell and his son, Mr Jamie Bell . In addition, Mr Peter Marr and Mrs Jean Fearon have sent to me two photographs of players in what appear to be two quite large-scale productions in the Memorial Hall. These can be viewed here. I was shown,by the Secretary to the Trustees at Silloth Nursing Home, a photograph taken inside the Memorial Hall of her father acting in one of my favourite plays, namely J. B. priestley's 'An Inspector Calls'. If you can provide me with a scan of this or any other photographs taken inside the Memorial Hall, I should be delighted to include them on this website. Please email . Mealsgate Brownies 1969. Photograph courtesy 'The Cumberland News, Carlisle'. There are eleven people in the photo and, to date, I have been given just nine names! The girl kneeling with the Japanese hat on is Gillian Marr's younger sister, Susan Robinson. Also, seen in the photograph are Julie Easterbrook, Shelia Penrice, Susan Newcombe (holding sword), Brenda Cowen, Julie Miller, Mary Bowness, Lesley Nixon and Christine Atkinson. 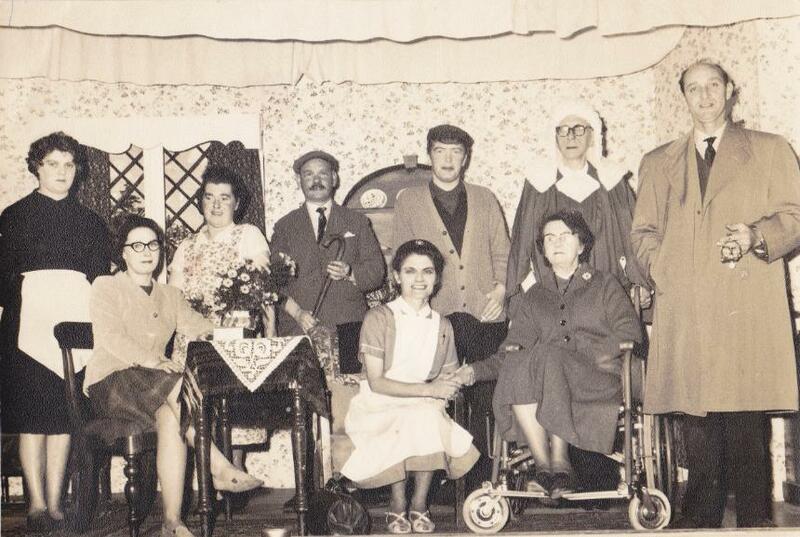 The cast of 'Night Must Fall', a psychological thriller by Emlyn Williams performed in The George Moore Memorial Hall circa 1970 by The Allhallows Players, an amateur dramatics group founded by Mr Alex Bell, Headmaster at Allhallows School, Fletchertown (1956-84). The names of the cast are:-Back row-Mavis Smith, Ada Hocking, Alex Bell, Brian Hocking, Syd. Dilley & Billy Marr. Front row- Eileen Bell, Anna (Hannah) Law (became Rudd in 1977) -in the nurse's uniform - and Elsie Dilley. Synopsis of the play first performed in 1935. Mrs Bramson, a bitter, fussy, self-pitying elderly woman, resides in a remote part of Essex with her intelligent yet subdued niece, Olivia. Mrs Bramson spends all her time complaining while sitting in a wheelchair (although it is revealed during the play that she has in fact no disability whatsoever). She is thoroughly disliked by her two servants, Dora, a young, sensitive maid and Mrs Terrence, the cook, as well as Olivia, who Mrs. Bramson also treats as a servant. One day, Dora reveals she is pregnant. Mrs Bramson considers firing her, but then decides to persuade the father of Dora's unborn child to marry her. The father turns out to be a suave, handsome young man named Danny. He almost immediately charms Mrs Bramson, causing her to forget all about Dora's pregnancy and take Danny on as her private assistant. Olivia, however, isn't as taken in by the charming Danny as her aunt is; she feels that he is putting on a facade and lying to hide something sinister. Her suspicions grow when, a few days later, it is reported that a local beauty has gone missing. Believing Danny to be involved, she, the servants, and her pompous admirer, Hubert, go through Danny's things when he is not around, finding a picture of him and the missing woman buried among his belongings. This shocking discovery strengthens Olivia's suspicions and determination to prove that Danny is not what he seems. Then one night, a human hand is found in the rubbish outside the house. Later on, a body is discovered in the woods — it is that of the missing woman, only without a head. Olivia now fears that Danny is a murderer. She also believes he keeps the head in a small hat box that he brought with him. Amidst all the chaos, Hubert tries to convince Olivia to come away with him and be his wife, but she refuses. One night, Mrs Bramson reveals to Olivia that she has a lot of money locked away in a safe in the middle of the living room. Olivia warns her that it is not wise to leave a safe in plain sight, but Mrs Bramson refuses to listen. Later that night, Olivia tries again to confront Danny and he tells her about his past. She tells him why she puts up with her aunt, even saying that she wished she could kill her, to which Danny replies that she probably couldn't. The two share a brief moment of understanding. They are interrupted by Belsize, a policeman from Scotland Yard who has come to briefly question Olivia and Danny in connection with the murder. While interviewing Danny, Belsize discovers the locked hat box. He asks Danny for the key, but Danny says it is not his. As Belsize grows more persistent and suspicious, Olivia comes in and states that the hat box is hers and puts it in her room. Later that night, the servants get ready to go home. Olivia also says she is leaving to stay with friends in London. She tells Mrs. Bramson she is too frightened to stay in the house and warns her to get out of the house too. Mrs. Bramson again refuses to listen to her niece, thinking she is just being overexcited. As Dora and Mrs. Terrence prepare to leave, Danny decides to accompany them. Mrs. Bramson is left alone and for the first time, the audience sees that she too is terrified. Danny soon returns and gets Mrs. Bramson ready for bed. When she drifts off to sleep, he gets a pillow and smothers her to death, although this is not explicitly shown. Danny then opens the safe and steals the money. He prepares to burn the house down, only to be interrupted by Olivia, who has come back and discovered her aunt's dead body. She tells Danny she has figured him out. Danny confesses. Just then, they see the lights of a police car coming to the house. Olivia says that the police must not get in, showing that she has fallen for Danny. Belsize and some other officers arrest Danny. Dora and Mrs Terrence are also present. Olivia tries to implicate herself in the crime, but Danny will not let her, confessing that it was all his own work. Before he is dragged away, he looks in the mirror and talks to himself, proving he is in fact insane. Then he grabs Olivia and passionately kisses her. To view more photographs taken inside the Memorial Hall click here.